At Dental Implants Center we offer highest quality dental implants from Straumann, headquartered in Basel, Switzerland. It’s the largest and most advanced dental implant company in the world. Dr. Navid Rahmani is an internationally recognized, Board Certified Periodontist and top rated dental implant specialist. All dental implant procedures are performed in our Midtown Manhattan dental center. Dentures have been made for hundreds of years and today’s modern dentures can look very natural and are quite different from the dentures worn by our parents or grandparents. Full dentures can replace the upper or lower sets of teeth or both sets and consist of a gum colored acrylic base to which replacement teeth are attached. Dentures are supported by the gums and underlying jawbone. There is an amazing range of denture teeth to choose from that can be closely matched to your original teeth. Although inexpensive, dentures are a less than perfect solution, often becoming ill fitting within just a few years of use due to changes in the shape of the underlying jawbone. We frequently see patients who have problems with loose dentures, making eating and speaking a chore. As a result it is easy for people to become cut off from others and to avoid social occasions. As the dentures rest on the gums they can create sore spots and the pressure on the gums increases the rate of bone loss, making the denture even more ill-fitting. Full mouth implants is a conservative and very stable way to replace an entire arch of teeth. It requires the use of multiple dental implants. Usually at least six or eight dental implants are needed to support a full arch bridge of 10 or 12 teeth. Full mouth implants treatment does provide highly predictable and long-lasting results but you do need to be prepared to wear a temporary restoration, for example a denture that has been adapted to accommodate the dental implants as it is important to avoid putting any pressure on the implants until they are fully integrated with your jawbone. Although this does mean spending several months waiting for the process to be complete, the results can be extremely good. Narrower screw: Mini dental implants have a much narrower screw and are often used to stabilize loose dentures or to replace very small teeth such as lower incisors and where there is not enough room for a conventional sized dental implant. Stabilize lower denture: They can be a particularly useful option for stabilizing lower dentures and there are several advantages in using this system over traditional dental implants. No bone grafts required: The narrower screw can avoid the need for bone grafts that would be required for more traditional dental implant treatment as it is much easier to find sufficient healthy bone in which to insert the dental implants. Speed up healing, no stitches: The process to place these dental implants is quicker and can be more comfortable as they are inserted directly through the gum tissue, usually eliminating the need for stitches which helps to speed up healing. Smaller design: The smaller design of mini dental implants means they are cheaper than traditional implants, making treatment more affordable. Your denture will be specially designed to clip onto the mini dental implants, ensuring it will be held firmly in place so you can eat and speak with complete confidence. The denture can still be taken out for easy cleaning. Multiple options: It can be worth enquiring about mini dental implants if you have previously been told you would require a bone graft prior to implant surgery or if you thought dental implant treatment was unaffordable. There are many types of mini dental implants that can be used and Dr. Rahmani will discuss all options with you during your first consultation. All-on-Four is an innovative solution for people who would prefer to replace their full denture with a complete arch of fixed teeth. With this option you will enjoy the sensation of having teeth that are permanently in place. The lovely thing about this treatment is that it is highly affordable, requiring just four dental implants to secure a lower denture, while an upper denture normally requires six dental implants. The secret to this treatment lies in the way the implants are inserted into the jawbone. Instead of being inserted at regular intervals along the arch, all four implants are inserted towards the front of the jawbone as this is the area where the bone is thicker and stronger, usually eliminating the need for any bone grafts. The first two implants are inserted vertically in the front of the jawbone while the additional two implants are inserted either side at a 45° angle towards the back of the mouth. Inserting these implants at an angle enables Dr Rahmani to use longer implant posts. This is advantageous as it provides a greater surface area for the implant post to integrate with the jawbone, ensuring it is extremely strong once it has fully bonded with the surrounding bone. Another nice thing about treatment is that you can receive your new arch of teeth immediately after the implants are placed. Once your new temporary bridge is in position, the implants cannot move, ensuring they can still bond strongly with your jawbone over the coming months. 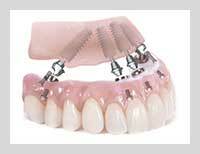 Your temporary bridge will be replaced with your permanent bridge once the implants have fully healed. Teeth in a Day is a technique that you may also hear being called Smile in a Day and it is a great choice for anyone facing tooth loss and who does not wish to wear dentures or to have to wait for months on end going through a lengthy traditional dental implant process. It is suitable for people struggling with loose and uncomfortable dentures and who may have suffered bone loss through tooth loss or through periodontal disease. People with congenitally missing teeth or who have lost teeth through an accident can also benefit. With this NYC dental implants treatment, teeth can be extracted, the implants placed and a new set of temporary teeth attached to the dental implants all on the same day. Another nice thing about Teeth in a Day is that it can often avoid the need for bone grafting. This technique is tried and tested and can produce amazing results for patients who currently struggle with loose and painful teeth, restoring self-esteem and self-confidence during one straightforward treatment. Teeth in a Day is a technique that is only possible through the use of advanced 3-D imaging and meticulous planning, which enables Dr. Rahmani to carry out this procedure in a way that is minimally invasive for patients. The issue of bone loss after tooth loss has been ignored in the past by traditional dentistry. This is so because dentistry had no treatment to stop or prevent the process of bone loss and its consequences. As a result, doctors had to ignore the inevitable bone loss after tooth extraction. 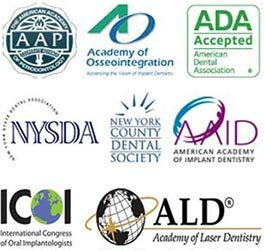 Do you have any questions about solutions for replacing a multiple teeth in NYC? Would you like to schedule an appointment with a best NYC dental implants specialist, Dr. Rahmani of Dental Implants Center NYC, please contact our office for consultation.